Here’s what’s happening across the border: FATF not satisfied with Pakistan’s actions against terror funding, and Pak Islamic clerics show solidarity with Saudi Arabia in Khashoggi case. 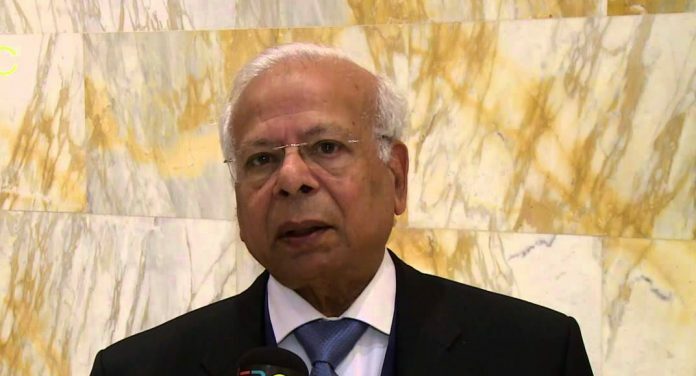 Dr Ishrat Husain, Pakistan PM Imran Khan’ adviser on institutional reforms and austerity, said Thursday that defence expenditure is not the big elephant anymore but it is the payment of debt amounting to Rs 1,500 billion that poses a major economic challenge to the country, reports Geo TV. Speaking at the Pakistan Policy Symposium held in Washington, Hussain said that the defence budget was merely 3 per cent of the country’s gross domestic product (GDP). The adviser said that the government approached the International Monetary Fund because their “financing gap is wide”. Additionally, Husain revealed that the government has decided to introduce reforms in Federal Board of Revenue, country’s federal body responsible for keeping a check on tax evasion money laundering, to increase tax collection and trace those who are defaulters. Stating that only 3.5 million pay taxes as opposed to 12 million, Husain stressed there was a need to “increase the tax to GDP ratio”. Amid allegations of Saudi role in the disappearance of journalist Jamal Khashoggi, Pakistan Ulema Council, along with its faction Waqaf ul Masajid, has called for expressing solidarity with the kingdom, reports Daily Times. Through a press statement issued on the occasion, the Council declared that the world was conspiring against Saudi Arabia by accusing it of complicity in Khashoggi’s disappearance. “Clerics and religious scholars…urged the leadership of Muslim Ummah to get united to contain conspiracies being carried out against Islamic world and Saudi Arabia,” it read. “Saudi Arabia is centre of Muslims’ unity and loyalty and any attack on Saudi Arabia will be termed as an attack on entire Muslim World,” the statement said. The statement also praised services of Saudi Arabia’s king Salman and his son Mohammed bin Salman, and assured all religious schools of thought were ready to defend the integrity and security of the Gulf country. “Pakistan and Saudi Arabia are tied to each other like body and soul,” the statement read. Pakistan army has won the gold medal in what it calls world’s toughest Cambrian Patrol competition, reports The News International. In Cambrian Patrol, organised by the British Army at Wales, participants have to cover a distance 60 km, carrying 25 kg of weight in over 48 hours. The Pakistan team comprised 11 members from a Battalion of Northern Light Infantry. In a tweet, spokesperson of Pakistan armed forced Maj. Gen. Asif Ghafoor called them “the brave soldiers from Pakistan’s Gilgit Baltistan”. Around 134 teams representing 31 countries are participating in this two-week long competition that started 8 October. Pakistan has been the winner for the fourth consecutive year. A nine-member delegation of Paris-based Financial Action Task Force (FATF), the global watchdog on terror financing and money laundering, has expressed its disappointment over Pakistan’s level of compliance with international best practices against terror financing and money laundering, reports Dawn. The delegation from FATF’s Asia Pacific regional wing shared its final findings with relevant authorities and bodies highlighting the country’s lack of implementation of legal frameworks and regulatory mechanism-related weaknesses of various institutions. It concluded that it was difficult to remove Pakistan from the ‘grey list’ if it continued at this pace. The team will submit its draft report regarding its on-site findings to Pakistan by 19 November, to which the country has been asked to submit its response within 15 days after the receipt of the report. It is on this basis that the delegation will submit its provisional report to the FATF office in Paris. Pakistan Prime Minister Imran Khan refused to leave office Friday despite his security guards requesting him to vacate the room when a low magnitude earthquake jolted the country’s capital city, The News International has reported. A 5.3 magnitude earthquake rocked most parts of Pakistan’s Khyber Pakhtunkhwa province Friday, whose tremors were also felt up to Islamabad. The PM was chairing a meeting with his party leaders when the incident happened. Khan remained seated in his chair while most of his party leaders stood up from their seats when the tremors were felt. The Prime Minister was asked by security guards to shift to an open place but he simply refused. According to Pakistan’s meteorological office, the epicentre of the earthquake was near the 120 km deep of the China-Tajikistan border along the Hindu Kush mountain range.